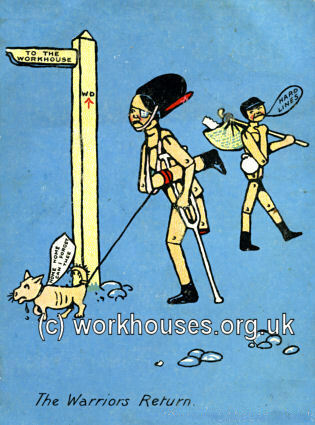 The poor laws and the workhouse inspired their own genre of literature and art. Popular songs and poems ranged from the sentimental (e.g. 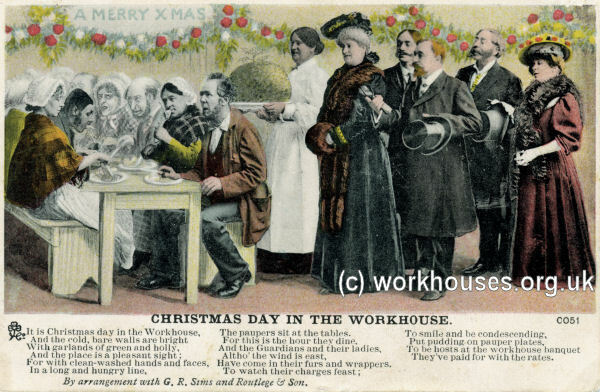 In the Workhouse: Christmas day ), through the satirical (e.g. The New Poor Law in Force ), to the sheer gruesome (e.g. The Vorkhouse Boy ). James Greenwood's lurid account of A Night in a Workhouse spawned a whole line of undercover exposés of workhouse life by numerous "social explorers" including Jack London ( The People of the Abyss ) and George Orwell ( The Spike ) and the less well-known but equally significant Mary Higgs ( Glimpses of the Abyss ) and Olive Malvery ( The Soul Market ). In more recent times, commemoration of the Irish Famine has produced some remarkable works of sculpture. Sold in the streets for a penny or halfpenny between the 16th and early 20th centuries, broadside ballads were popular songs of the day, often anonymous, and were performed in taverns, homes, or fairs. The examples below, relating to the poor-law and workhouse, are from the Bodleian Library's collection. A Bodleian shelfmark follows each title. You can listen to a recording (MP3) of The Workhouse Boy (a variation on The Vorkhouse Boy above) performed by the Seven Dials Band (by kind permission of Beautiful Jo Records). In the early 1900s, collectors of English folk songs such Cecil Sharp and Ralph Vaughan Williams, used workhouse inmates and casuals as one of the sources for their material. One of these (name unknown) was photographed at St Marylebone. The American folk song collector James Madison Carpenter visited Britain in 1928 and recorded singers at the Ely the Insch parish poorhouse in Aberdeenshire. He also collected songs from the Ely workhouse in Cambridgeshire. The colllection has an online catalogue. The workhouse was occasionally the subject of maudlin ballads such as Standing at the Workhouse Gate by B.K. Aungur in around 1908. Modern songs by Peter Higginbotham. The Archway of Tears — The Archway of Tears was the local name for the entrance to the Birmingham workhouse. Charles, James Chelsea Workhouse: A Bible Reading (Our Poor) (1877) - in this unusually lyrical portrayal of a workhouse, a group of elderly female inmates sit at a table, bathed in sunshine. Some drink tea while one of their number reads from the bible. 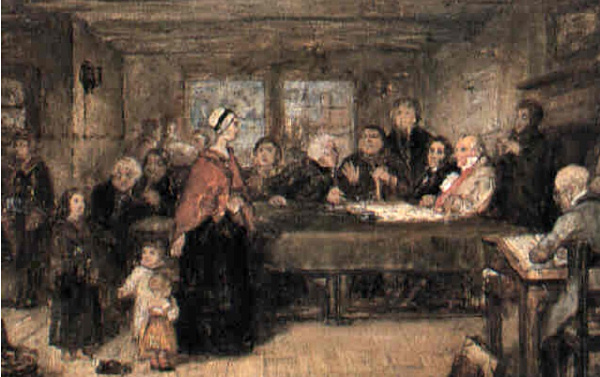 Cope, Charles West Poor Law Guardians: Board Day Application for Bread (1841), was based on a visit to a meeting of the Staines Board of Guardians. It, shows a young widow pleading for relief for her four children. Thomas Rowlandson St James Workhouse, 1809. The Lurgan Workhouse Mural, 2006. Chelsea Workhouse: A Bible Reading. Board Day Application for Bread. S.L.B. (1866) Description of a visit to an unnamed District School in the London area. George Green Gabb, Master of Droitwich Workhouse Master (1849-53) compiled by Martin Gabb. The colourful career of William Bragger, Master of Wrexham workhouse (1857-1863) researched by his great-great-great grandson Andrew Taylor. Shaw, Charles (1903) When I was a Child includes memories of the Wolstatnton and Burslem workhouse at Chell which Shaw entered as a child in 1842. 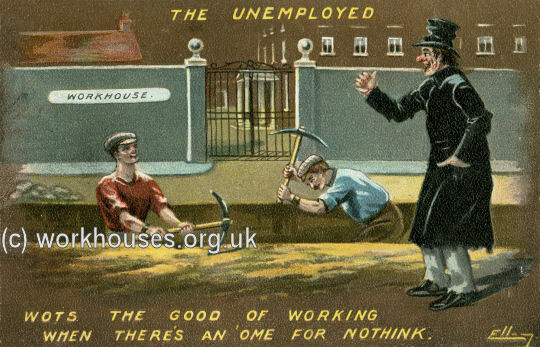 A sardonic postcard from 1907 — "Wots the good of working when there's an 'ome for nothink"
A humorous interpretation of the play-title The Beauty of Bath, c.1906. Punch Magazine's typically irreverent take on the Guardians interrogating a relief applicant in 1899. Irish National Famine Monument at Croagh Patrick in Co. Mayo, 2000. Casual Ward graffiti collectd by Poor Law Board Inspector Andrew Doyle in 1865.